The Galaxy S4 announcements just keep on rolling. T-Mobile, the Un-carrier, has announced that the 16GB version of Samsung’s newest flagship will be on their website starting April 24 for the price of $149.99. It should arrive in stores by May 1. There doesn’t seem to be any pre-orders available for T-Mobile like other carriers, but that trade-off comes with getting the device available a few days earlier. This phone will be shipping with T-Mobile’s new LTE bands packed inside so you can make use of them whenever T-Mobile gets their new network in your area. Anyone looking to switch to T-Mobile for their new Un-carrier way of doing things and picking up the GS4? America’s Un-carrier continues making bold moves to give consumers affordable, unrestricted1 and hassle-free ways to get the latest 4G LTE smartphones. No annual service contract plus unlimited talk, text and Web on a blazing-fast nationwide 4G network. The ability to save money upfront and every month over AT&T, Verizon and Sprint through the Simple Choice Plan. HD Voice for nationwide crystal-clear high-definition calling and reduced background noise. Smartphone Mobile HotSpot feature for sharing the Samsung Galaxy S 4’s connection to the T-Mobile 4G network with up to five Wi-Fi capable devices (tablet, e-reader, laptop, portable gaming device and more). Smartphone Mobile HotSpot is included with every Simple Choice Plan. 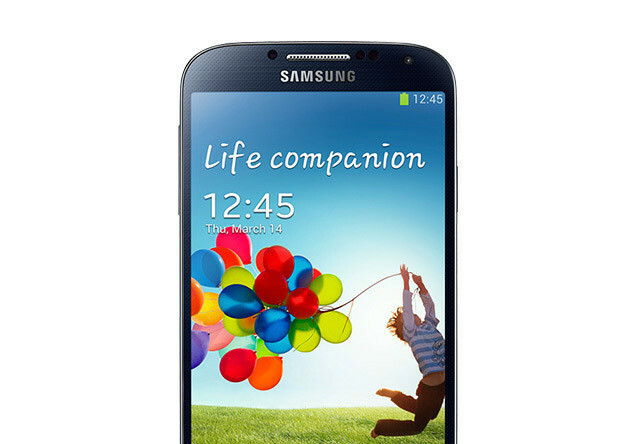 The Samsung Galaxy S 4 joins a growing line-up of T-Mobile 4G LTE devices. The device features the latest Android operating system — Android™ 4.2.2 (Jelly Bean) — and a speedy 1.9GHz quad-core Qualcomm®Snapdragon™ processor. In tandem with T-Mobile’s blazing fast and unlimited 4G speeds when paired with the Simple Choice Plan with Unlimited Nationwide 4G Data, the Galaxy S 4 enables customers to quickly upload or download their favorite photos, videos and TV shows without worrying about expensive overage charges. Dual Camera for recording stills or video with the front and rear cameras simultaneously. Eraser Shot to remove unwanted objects or people from an otherwise perfect picture. Drama Shot for snapping a burst of 100 images in four seconds to create animated GIFs. Samsung WatchON is a whole new way to use your phone with your TV. It transforms your Samsung Galaxy S 4 into an integrated smart remote to control your home entertainment system including TV, set-top box and DVD player. With the WatchON service, you can get recommended TV, movies and sports according to your personal tastes. Samsung Smart Pause will automatically pause videos playing on your Samsung Galaxy S 4 if you turn your head away and resume once you’ve looked back.